Ah, I feel so happy. Exam is finally over. I think some were pretty easy but others were some how difficult. Especially, the Pendidikan Moral and Pend. Sivik. I feel so free, now probably I might post more on my blog! 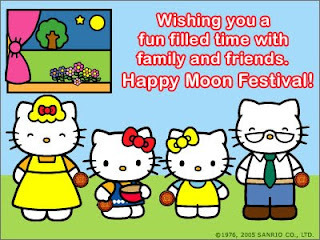 Next Tuesday (3/10/2009), is Children's Day. Our Maths teacher said that he might provide KFC (Kentucky Fried Chicken) for our class on Children's Day because it is also my class monitor's birthday. I can't wait for Children's Day. 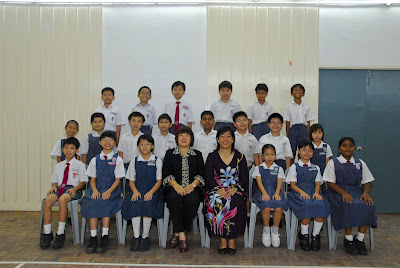 Today, some of classmate are going to my classmate mum's cafe to meet Ian Teng(who recently left our school). Too bad.. Ian didn't come.. It is a nice cafe. After that, I went to the Perpustakaan Negara(also known as the National Library.) I borrowed 9 intresting books. Mwahaha.. now I won't feel so boring on weekends. Did you see this before? Can you imagine this is a "fan"? Few days ago, I saw this new technology produced from paper. It is so awesome! 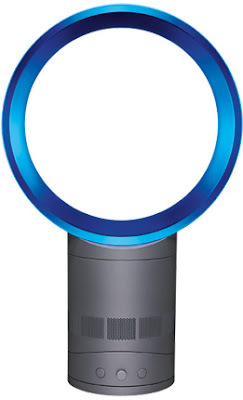 A fan without blades and no buffeting. This is called "Air Multiplier Fan. "Convenient,eh?It is invented by James Dyson. He is an Englishman. For more details just click Dyson. This morning, Mom didn't prepare breakfast for me, instead Dad cooked his best (actually he has limited recipe only =D) French Toast for me. It looks like quite easy to cook.... breads + eggs + sugar. The taste was nice, I brought some to school to share with my friends too. If you wanna to learn how to make French Toast, maybe you can try this out. Mum bought me two books, one is titled "Help! I Have To Take A Test". This book explains how to prepare our exam, and what we should do during the exam......... I hope it will really works. Another book is " Get Organized Without Losing It" this is also a very motivated book because I always lose itemsss at school . Due to some reason our headmaster announced that our exam has been postponed to start on 26-10-09.Yay! I have more days to do my revision, but since I transferred to this school for 3 months, I am still a little nervous for a few subject, especially the subjects in B.M but my Super Mum really helps me a lot, she coached me and guided me even though she is not so good in BM. A set of stamps " A caring society give children their right" was issued on 09-10-2009. Year 2009 is the 20th anniversary of the Convention on the Rights of the Child (CRC). This legally binding treaty calls on all citizens of the world, from its leaders to each one of us; women, men, gilrs and boys, to live up to our duties to ensure every child survives and thrives, free of hunger, want, neglect and abuse. The CRC demands from every one of us, as part of a caring society, to place children at the heart of human development. Not only because this offers a strong returnon our investment; nor because the vulnerability of childhood calls upon our compassion; but rather because that is every child's right. Yesterday, our church elders invited the whole church to a steamboat dinner. There were about 8O people altogether. We ate at Yuen Restaurant which was located at Sunway Pyramid. There are "Eat All You Can" self service concepts. I had a great time with my friends, we ate a lot of seafood, Gerard's favourite food - green noodles, Joel's favourite - BBQ chicken Wingssss (Gerard and I counted he ate 14 pieces of chicken wings already, hahaha....) Of course we also had ice-cream as dessert. Yesterday, my school gave us an 'Ang Pao' for Deepavali. Actually, ang pao were used by Chinese people on Chinese New Year and their traditional ang pao colour is red. Since Chinese people are one of the greater races in Malaysia the other races also liked Chinese cultural they also learned to use ang pao on their festivals. 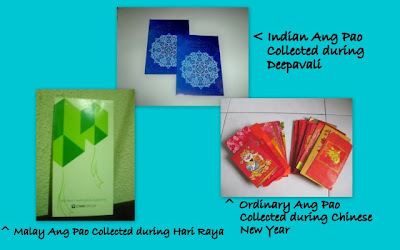 The Malays gave ang pao on Hari Raya and their ang pao is green in colour and Indians on Deepavali will give their children the ang pao (blue colour). I think this is also our Malaysian great speciality. Hmmm...... I wonder if Christmas Day also has ang pao what colour will it be? Today, when it was our Science Lesson, Teacher Faizol came with the book, he was taking a nice look at the class, suddenly........ He called my name "Henry Chay" Yeah! Teacher Faizol gave me the book, it was real! He chose me, thank you Teacher Faizol & I wanted to thank God this year I am so blessed. God really always answers my prayers! I watched an advertisement at youtube, it was so touching. It is a story of a deaf and mute girl who learns to play violin against all odds. The story also encourage that all of us can shine in different areas, and don't tease others. I like this advertisement, it is so special. lanterns at our gate, we have a good time with family. Yesterday, someone invited my parents and Aunt Cindy to an Open Raya buffet, so my parents left me at Aunt Cindy's house. When they left, it was about 6:30 p.m. After a while, Brother John and I heard some people shouting,"Earthquake!" and some footsteps. Minutes later, Aunt Sheong knocked at our door and told us to run. Brother John and I hastily ran down the stairs. To our surprise, we saw a lot of people outside the flat. While we were waiting there, Brother John told us that he was actually trembling while playing the computer. At first he thought he was having a headache then he only figured it out that it was the earthquake problem.